When you’re a kid, becoming an adult seems like the best thing that’ll ever happen to you: no more homework, no one telling you what to do, and you’ll get to see the world. In reality, however, you’ve got bills to pay, a boss that’s hounding you non-stop, and barely enough time to breathe, let alone get away. But it doesn’t have to be the way -- at least, not all the time. Hear us out on this one. 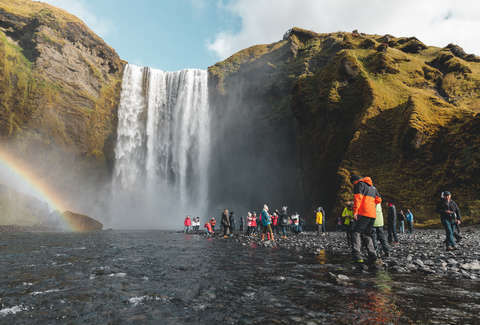 Noken, a brand new travel startup, wants to pay you to explore the world -- specifically Iceland, Japan, and Portugal -- as their first-ever Cultural Exploration Officer (or CEO). The company will pay for all three trips and give you a $100 stipend for each day you spend there, but the rest is on you. The fledgling company knows you’ll have to keep your day job to afford such an experience, so they’re willing to allow you to decide when you’ll be traveling. Sound too good to be true? We know, but no need to keep pinching yourself -- this is totally legit. Noken, a first-of-its-kind travel company, dedicates literally thousands of hours to researching each of its destinations before recommending them and they want you to help by sharing your experience. They stand to benefit, too, of course. As CEO, you’d be responsible for immersing yourself in each of your destinations and creating content to share with the world in the form of Instagram photos and blog posts. That’s it. No conference calls, budget meetings (except maybe with yourself), or any of the other annoying things that come with running a company. Noken is looking for someone 21 or older with a valid United States passport, a whole host of vacation days or the ability to work remotely, a public Instagram profile, skill at racking up likes on the ‘Gram and, most importantly, an interest in living the life of a true jetsetter. That’s it. No schooling, references, or cover letter required. If this gig sounds like something you’d be into, take a shot and apply. The competition’s sure to be stiff, but to quote the great Wayne Gretzky and/or Michael Scott, “you miss 100% of the shots you don’t take.” What are you waiting for?